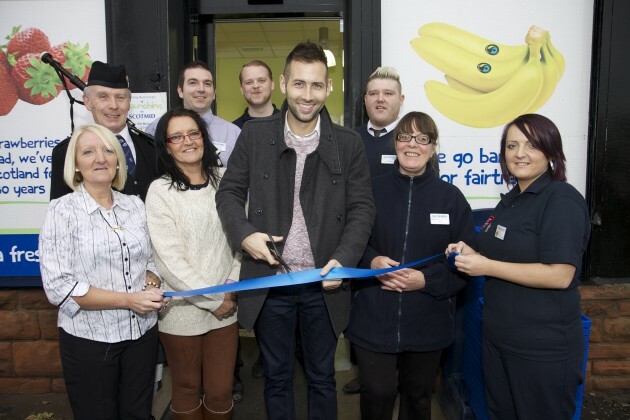 Romeo cuts the ribbon to launch Scotmid Old Kilpatrick. Crowds from Old Kilpatrick turned out today (15 November 2013) for a special event to launch the new Scotmid Co-operative store (formerly Morning Noon & Night). Clyde One Radio DJ, Romeo, cut the ribbon and gave out free goody bags to the first 50 customers. The new-look Scotmid Old Kilpatrick has been transformed inside and out to bring the store up to an award winning standard, with a range of new features and services for customers. Scotmid Old Kilpatrick now has an in-store bakery from local bakers Aulds, a larger area for chilled food, a bigger selection of fresh produce available, and will stock more products from local Scottish suppliers. The store’s interior and exterior have also been given a modern makeover, with a striking new design which emphasises Scotmid’s Scottish heritage. Scotmid Old Kilpatrick is at 2 Freelands Place, Old Kilpatrick, G60 5ED and is open from 7am to 10pm, seven days a week.